After rebounding from local correctional level of 50%, Euro started falling down again. so far, bears slowed down a little bit, but they are expected to start new descending movement very soon. Target is still in lower area, where there are several fibo-levels. As we can see at H1 chart, local correction reached level of 50% and right now is trying to rebound from it. In addition to that, here we can see that pair is rebounding from temporary fibo-zone, thus increasing chances for reverse. Possibly, bears may return to the market during the day. Franc was able to rebound from level of 38.2% and right now is starting new ascending movement. I have only one buy order so far, but plan to increase my long position after completion of local correction. Target is in upper area, where we can see several fibo-levels. 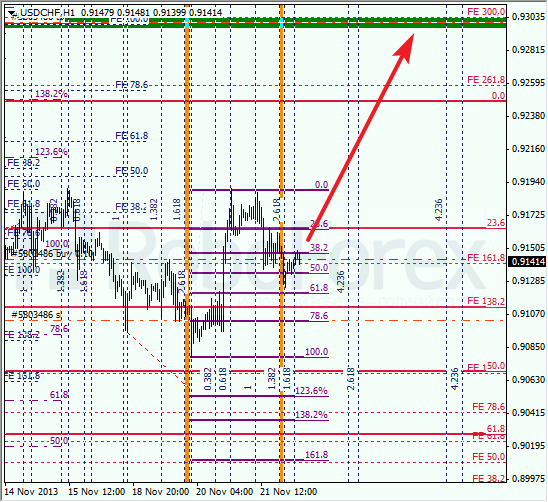 At H1 chart, we can see that current correction almost reached local level of 61.8%. Pair rebounded from this level almost inside temporary fibo-zone, which means that price may start new ascending movement.